While most SDRs have remained in the domain of RF and protocol experts, LimeSDR is usable by anyone familiar with the idea of an app store - it’s the first SDR to integrate with Snappy Ubuntu Core. This means you can easily download new LimeSDR apps from developers around the world. If you’re a developer yourself, you can share and/or sell your LimeSDR apps through Snappy Ubuntu Core as well. With state-of-the-art technical specs, fully open hardware and toolchain, and integration with Snappy Ubuntu Core’s app distribution platform, LimeSDR is limited only by our collective imagination. Board schematics: Altium project files available under CC BY 3.0 licence. Board layout: Altium project files available under CC BY 3.0 licence. Manufacturing: Gerbers, drill, and pick & place files are also available under CC BY 3.0 licence. 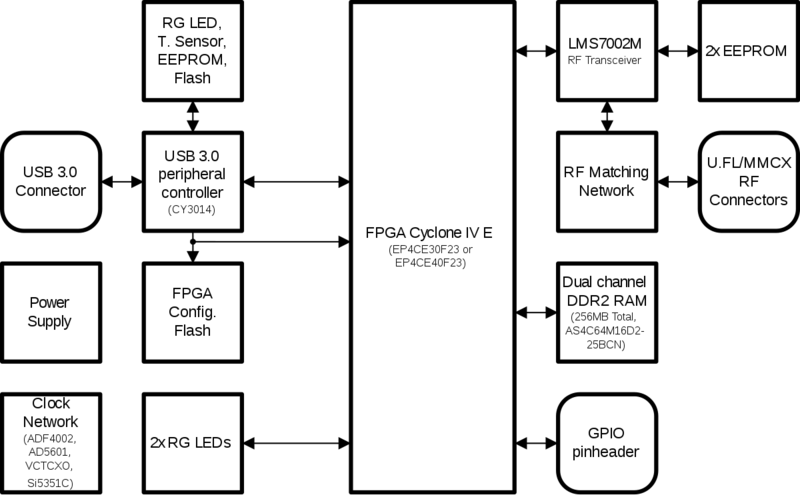 FPGA: Altera Quartus project available under CC BY 3.0 licence. Host connectivity: Cypress FX3 USB 3.0 controller firmware sources available under Apache 2.0 licence. Host software: driver and GUI sources available under Apache 2.0 licence. Programming toolchain packages: GNU Radio, Pothos, SoapySDR, UHD. Documentation: transceiver datasheets are NDA-free. Downloadable apps: Snappy Ubuntu Core, licensing up to app developers. Like the move to open source software with general purpose computers, the programmable, fully open source LimeSDR represents a fundamental shift away from the traditionally single-function and heavily proprietary wireless domain. We’ve been working directly with the IoT team at Canonical, the makers of Ubuntu, to enable the use of Snappy Ubuntu Core on LimeSDR. LimeSDR’s integration with Snappy Ubuntu Core means that you benefit from the collective work of developers around the world. With LimeSDR, we are laying the foundation for a world in which “there’s an app for that” applies not only to mobile phones, but also to the cell towers they connect to and, indeed, every wireless device or piece of infrastructure. LimeSDR brings with it many opportunities for educational and maker communities, empowering them to learn, and create new applications and even new markets. LimeSDR puts serious power in the hands of anyone who wants to innovate in the world of wireless.